Gregory van der Struik has been Principal Trombone with the Australian Opera and Ballet Orchestra since 1987 and a part time member of the brass faculty at the Sydney Conservatorium from 1993-2004. He studied trombone with Geoffrey Bailey and Arthur Hubbard at the Sydney Conservatorium High School and graduated as an Associate of the State Conservatorium of Music (A.S.C.M.). Prior to his appointment as Principal Trombone, he undertook extensive freelance engagements with professional orchestras as well as holding principal positions in the A.B.C. Sinfonia (which he conducted in the Opera House), the Australian Youth Orchestra and the Sydney Youth Orchestra. 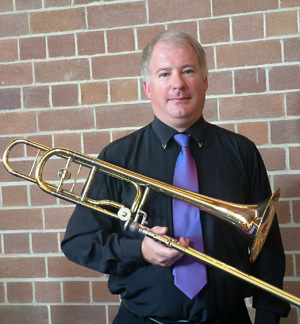 As a soloist, Greg has released and been featured on a number of CDs which emanate from the Trombonist Australis Project, initiated in 1990 to develop and present an Australian contribution to international brass repertoire. He has given over one hundred performances in Australia, Europe and Asia with a variety of ensembles. Greg has also addressed international conferences of the Internationale Gesellschaft zur Erforschung und Förderung der Blasmusik (IGEB) and World Association of Symphonic Band Ensembles (WASBE) with respect to the development of Australian trombone repertoire and has also been the author of numerous articles for journals in Australia and overseas. Greg has given masterclasses in Australia and overseas including a period in 1998 as guest lecturer in trombone at the Shanghai Conservatory and later that year, Acting Head of Brass at the Sydney Conservatorium. Greg has also been enterprising as a chamber musician being a founding member of the Early Brass Consort of Sydney and has been active in promoting Opera Australia Brass which made a highly successful concert tour of China in May 2000. Future projects include recordings of repertoire for trombone and organ, recitals for national and local radio as well premieres of a number of his compositions.